I got here on Saturday and Hilary Shor, one of the producers of “The Butler,” took me to the gorgeous old New Orleans home in the Garden District, where our director, Lee Daniels, is staying. 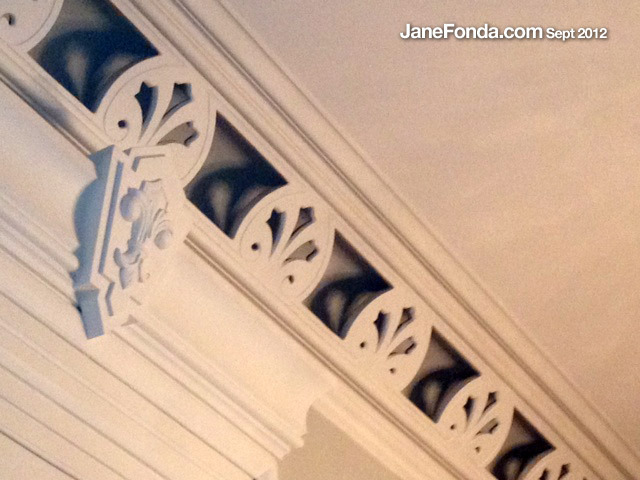 It is a breathtaking house but I was not allowed to take photos except for details of the unique crown moldings in the ceiling. Outside, the intricate old wrought iron grill, such a trademark of old New Orleans, was jaw-droppingly gorgeous. 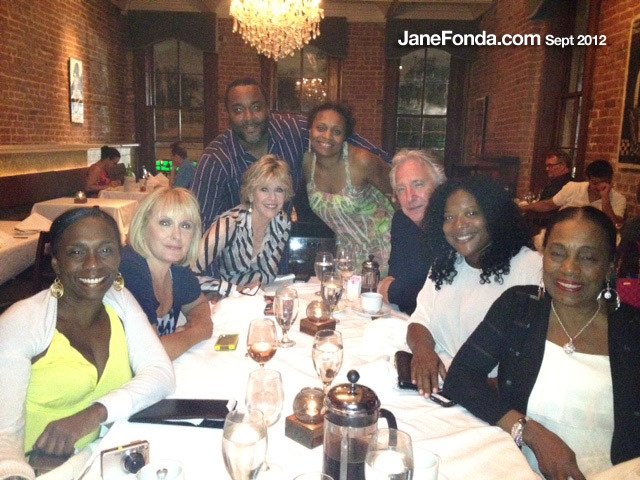 Many members of Lee’s family were there and we all went to Coquette, a superb New Orleans restaurant in the Garden District for dinner. A word about Lee (though he warrants a book! ): We’re all unique, I know, but Lee Daniels is more unique than most! He is brilliant, flamboyant, irascible, challenging, in other words, fascinating. Never wore anything but pajamas–nice ones, pressed, tasteful, but still. He said they’re comfortable and appropriate as he’s in the process of giving birth (the film). 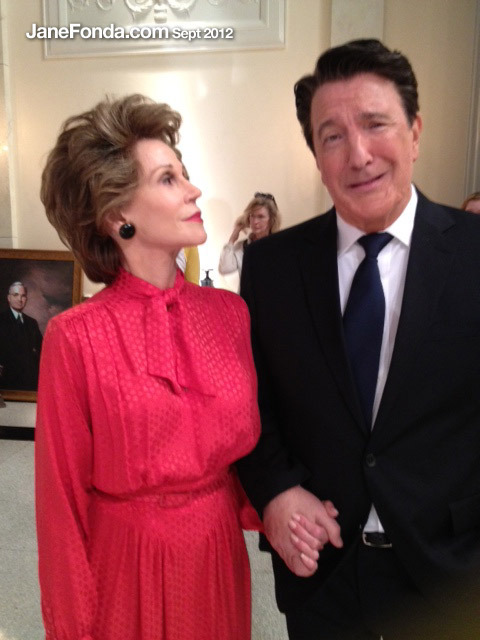 The next day I got into my Nancy Reagan hair, makeup (a 21/2 hour process) and costume–red, of course–After much scrutinizing, questioning and attention to detail, Lee finally approved the look. On Sunday, my first scene was with Forest Whitaker who plays the butler. In the film, both he and his wife, Gloria, (Oprah) age more than 40 years and were in their 80s by the time of the Reagan Administration. I found it very moving to look up into Forest’s aged, soulful eyes. What a superb actor he is–always. 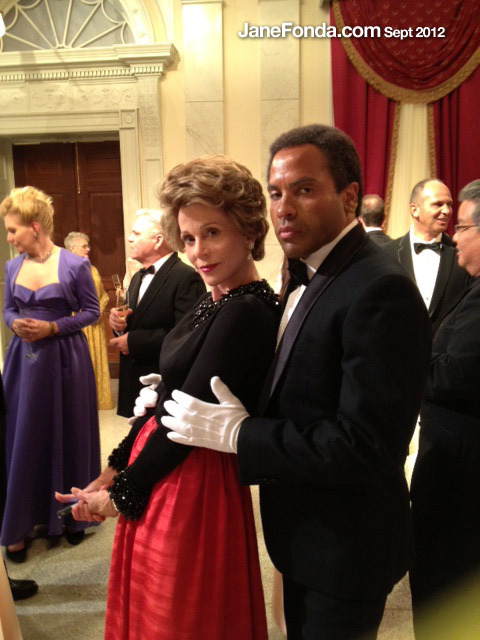 But this script –based on a true story and historical events–is particularly powerful and moving…seeing those critical events –the rise of black power and civil rights movements, cuban missile crisis among many others – through the eyes of a black butler who was at the White House serving five administrations, from Truman to Reagan. That first day we also, and unexpectedly, (the unexpected is common place with Lee Daniels), shot the Reagan’s arrival at a formal state dinner. Nancy had just invited the butler and his wife to attend– not as butler, but as guests. It was strange to be announced, step onto the landing, accompanied by Marshall music and look down onto the assembled guests in formal attire to see Oprah, just like any other extra. As her character she exuded the sense of someone who was out-of-place and out of her mind thrilled to be there. I really believed it. We shot that night until 11pm and I had barely enough time to take off all the Nancy paraphernalia and make it to another superb restaurant, Sylvain, in the French Quarter, with Hilary. She encouraged me to order one of the most delicious salads I’ve ever had: shaved raw Brussels sprouts, pared and diced green apples, hazelnuts, pecorino cheese, with white balsamic vinegar dressing. OMG! And it’s also healthy. The owner promised he’d send me the recipe and, if he does, I’ll post it for you. In the small world department, turned out that Jimmy Buffett had flown into town for the Saints football game Sunday, bringing with him a beautiful guitar that he signed for me to auction off. (The Auction benefitting my Georgia Campaign for Adolescent Potential and Power, will celebrate the 40th anniversary of “Klute”, and Sandra Bernhardt will be the auctioneer! The event takes place in New York at the Darby Hotel on Oct 11th and you can find more event information here: http://www.gcapp.org/klute ) Jimmy, his pal Kino Bachellier and I had a drink together at the Windsor Court bar and caught up on stuff. He and Janie, his wife, are headed to Australia to visit their daughter who’s doing a ‘year abroad’ there. What a terrific guy Jimmy is, and amazingly fit!! I asked him if he works out and he said he stands on his surfboard and paddles with a long paddle (really challenging to the core muscles), even taking waves while standing and paddling…and he plays a lot of tennis, as well. I enjoyed another evening out when I went to dinner at “Cochon” the famous pork place, with Lenny Kravitz and Hilary. I was impressed with how nice Lenny is. I ate too much cause it was so good–they raise and butcher their own pigs–and Lenny hardly had anything cause he’s doing a cleanse. Oh! Almost forgot, I asked Oprah about a tweet she sent out a few weeks back raving about the Season 2 premiere of “BOSS“. She confirmed that it is indeed among her favorite shows! For those of you who don’t know, my son Troy Garity is on that show playing reporter Sam Miller. Oprah had not made the connection, I was pretty proud. I blogged a while back about my visit to Chicago while they were shooting the show there this summer. “Boss” airs Friday evenings on the STARZ cable network. Greetings from the small Kingdom of Denmark! Thank you for sharing your experiences, both in and out of the set! As a fellow actor/Director I thoroughly enjoy the details of interesting work! Needless to say I am an admirer of your body of work, with the broad scope it entails! This salad indeed sounds delicious! I am a sukker for delicious and healthy food ( a combination made in heaven) so will be looking forward to the recipe!!! If you ever come to this part of the globe, please let me know and I will be delighted to show you the raw beauty of Scandinavia!!! Oh, love the T-shirt with your mug shot on it! I can’t wait to see this movie! What a cast!!! John Cusack, Forest Whitaker (incredible in Last King of Scotland), Oprah Winfrey, Robin Williams, Alan Rickman, Mellisa Leo, Jane Fonda!!! This is a movie goer’s dream cast! To see all of you transformed into these historical characters will be so fun to watch!!! And Lee Daniels directing it! I loved “Precious”, a very powerfully disturbing movie! And I think he directed or produced “Monster’s Ball” too? Wow! Will this movie come out next year? Can’t wait! I’m looking forward to this movie. 🙂 You’ll rock, I’m sure and so will Alan Rickman, Oprah, Robin Williams and Forest Whitaker (incredible actor and yet we haven’t seen him often enough in heavyweight movies since his Oscar win). However, there are some members of the cast and crew I’m not particulary fond of, like Melissa Leo (her style is a bit out there for me and her award acceptance speeches turn me off, quite frankly). I like Lee Daniels though I’d like him also to be more subtle. Less is more sometimes. Uta Hagen’s book is called Respect for Acting and don’t feel guilty about admitting. Sometimes you need to refresh things and practice (it’s like speaking a language: one has to wipe the dust off things; however, I think you’re doing more than fine). Recently, I had the good fortune to meet Wil Haygood, on whose article The Butler is based. I’m a writer, but I work as a waiter to pay the bills (“the suffering artist’s dues,” as it were). One evening at the restaurant, I heard three guests, all of whom were engaged in a passionate discussion, the subject of which was film. As I am known to be a complete and utter cinephile, I spoke briefly with them, then went about my duties, as it’s important to be professional and polite, though never obtrusive. A short while later, I served three guests at a table near to the other three guests of whom I just spoke. The trio at my table had just returned from speaking with the other trio (they with whom I had briefly discussed film). I told her, “I’m a writer,” and went on to explain that I’d read Danny Strong’s (along with Mr. Haygood and Mr. Daniels) screenplay. “It’s a beautiful story,” I said. My guest then pointed to the first trio of whom I spoke, and said, “It’s his story; he wrote the article,” and quickly encouraged me: “Go talk to him. Oh, this is great!” The other two guests dining with her eagerly concurred. He and I then talked “shop.” What a wonderful conversation and privilege it was. For a writer, having a chance to discuss writing with another of his kind seems a blessing. One feels as if he’s been given a grace note, a kind of anchorage. 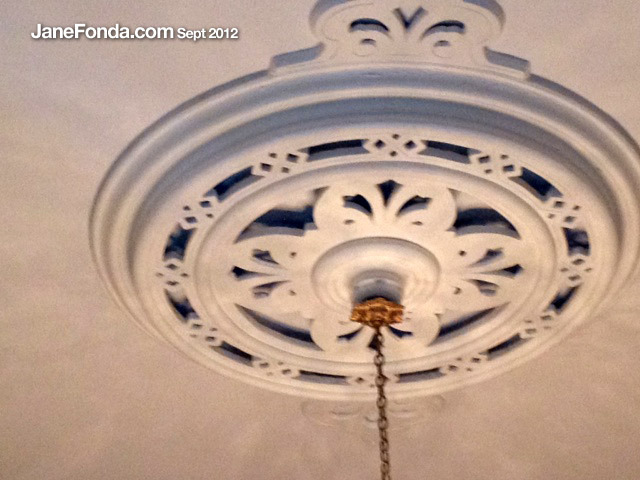 During moments in our discussion, Mr. Haygood would shake his head, bemused and grinning, and say, “My goodness, John! You really did study the script, didn’t you?” To which I responded, “Yes, sir, I certainly did.” Then I shook his hand and told him what a genuine honor it was to meet him. What a dear man. And I’m looking forward to the film. As I said, the screenplay is very good. Danny Strong has written some moving, muscular, informative scripts (Game Change, Recount). His talent, coupled with Mr. Haygood’s and Mr. Daniels’s (I respect the stories he tells, and the risks he takes; he, like I, focuses on character and substance rather than formulaic flash), and no doubt the cast (including yourself) signals to me that it is going to be a memorable experience. Already Mr. Haygood has told me of the powerful performance given by David Oyelowo. Having seen Mr. Oyelowo in The Paperboy, and anticipating his role in Steve McQueen’s Twelve Years a Slave, I’m quite keen on seeing the finished work. 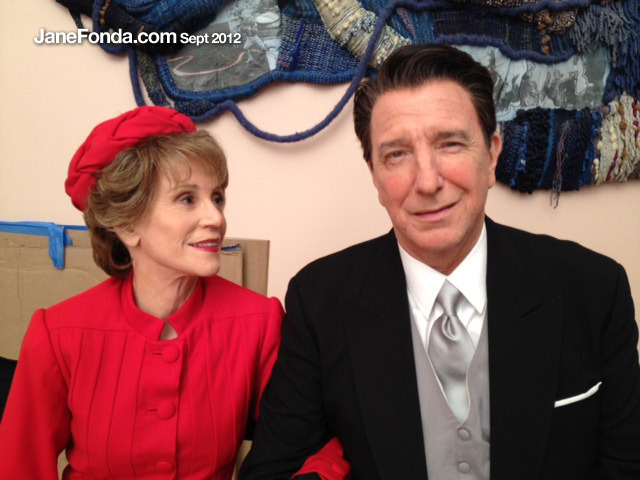 And, of course, your interpretation of Nancy Reagan. The stills you’ve provided in your post make fall seem far away (ha ha). But I will wait patiently. Frankly, any chance to see you explore a character and share your art on the big screen is cause for celebration. When you announced that you were retiring, oh, I was saddened. 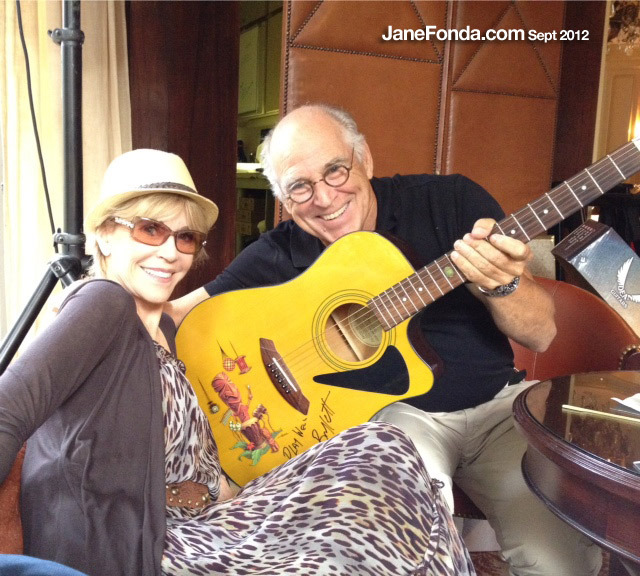 No more performances by Jane Fonda? I thought. No! In fact, I remember seeing Stanley and Iris (the great Martin Ritt, Irving Ravetch, and Harriet Frank, Jr.) the night it opened, and as I sat in the darkened cinema, I experienced such a bittersweet feeling. I loved the film (it’s a wonderful story, and you and Mr. De Niro were wonderful, as were Swoosie Kurtz and Martha Plimpton), but I couldn’t help but to keep thinking, This is it. 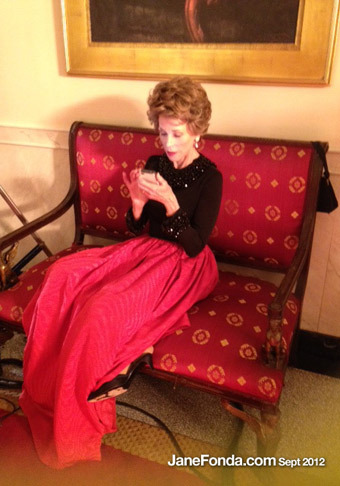 This is it: Ms. Fonda’s last role. At the time, I consoled myself by recalling the wonderful work you’d already done and shared. Well, I thought, I’ll have to make do. There are still Gloria and Bree, Julia and Sally, Kimberly and Judy, Gertie and Viveca/Alex. And now I haven’t to do that. May I say, most appreciatively, Thank you? Oh, thank you! Thank YOU, John. This is a wonderful story! Oh, Ms. Fonda, you are very welcome. When I think of what you’ve offered humanity through your art, life, and activism, I am inspired. In fact, you’re one of the reasons I became a writer. It’s the passion and discipline you’ve applied to your art that, when I was a child, infected me in the most benevolent, inspiring way. And so it remains. Among the decades of your life, you’ve shown that we are a discerning species that must do our best to serve, to learn from, and to enlighten both others and ourselves — all of which are best done selflessly. This reminds me of my favorite epithet in a book: “Only connect” (E. M. Forster, Howards End). Two simple words, of four syllables, that remind us of why we’ve been given life. My father died when I was a child (two weeks before my ninth birthday), and what saw me through (and continues to) that sad period was a wonderful mother and film. I remember one night when my father was quite ill (he had multiple myeloma and plasmacytoma), and my mother and I, unable to sleep, sat up and watched Comes a Horseman. For a couple of hours, we were able to relax and enjoy a beautiful story. Of course, Mother was taken with James Caan (Brian’s Song, though a difficult film for her to watch, provided her with some comfort: I think that film helped her not to feel so alone), and I, of course, was taken with you: the strength, talent, and beauty with which you brought Ella Connors to life (Richard Farnsworth was wonderful, as well!). After my father’s death, I was numb: not only by the fact of his passing, but by the realization that my childhood had adroitly ended. When a child realizes the presence and inevitability of mortality, as I did, he can neither live nor play with quite the same level of innocence as he once did. Instead of entertaining a child’s thoughts, I found myself contemplating the larger questions. Among them: Why do we exist? What is the risk of love in the face of loss? The following year, you co-produced and acted in a film that allowed me to laugh again without feeling guilty. You were a guest on, I believe, Merv Griffin’s show, along with Lynda Carter. You were talking about a new film you had coming out; it was about a trio of secretaries who stand up to their chauvinistic boss. In 1981, my mother remarried. He wasn’t a kind man, but he was practiced in the art of deception. 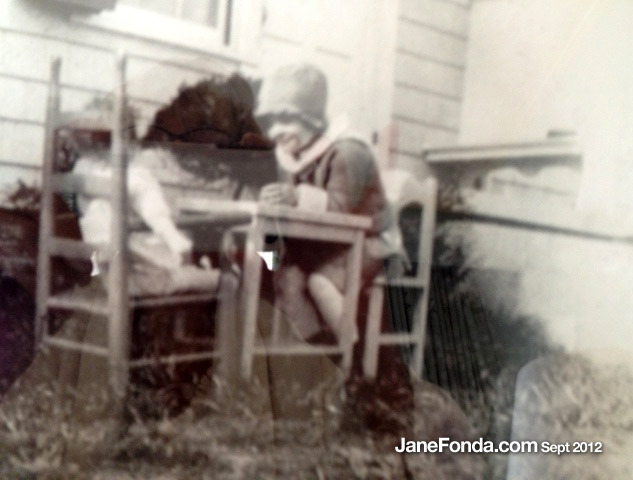 Neither my mother, sister, nor I knew what he was like until it was too late. He was difficult, a stranger to his emotions, and not one to be moved or to compromise. That same year, I went to see On Golden Pond, which remains one of my favorite films. Here were clues and data to the questions that had plagued me since my father’s death. The importance of family, of friendship, of tolerance, of love — Golden Pond encompasses all of it. On top of that, the acting is superb. True, your father all but the stole the show with his incredible performance as Norman Thayer Jr. However, Ms. Hepburn, you, Doug McKeon, Dabney Coleman, and William Lanteau were all wonderful, too. Walter, really, is the point of the film, isn’t he? But your wonderful father was the anchorage. As was Ms. Hepburn and the rest of you. A truly great ensemble. Of course my stepfather (my mother and he are no longer married) had no interest in seeing this film about which I kept talking. But I was vigilant in my desire to get him to see the film. I thought it would help him, you know? So I devised a plan. I started saving my allowance, and continued to do so until I had accrued enough money to buy movie tickets for everyone in my family. For Easter that year, I told them I had a gift for them: We were all going to see On Golden Pond. Which we did, and which everyone in the family loved and was moved by save for, of course, my then-stepfather. But you know something? At least I tried. And my instruction continued. Gertie in The Dollmaker reminded me of the importance of dignity, integrity, and strength in the face of loss. Dr. Martha Livingston showed me the importance of having a discerning mind, of helping others not out of selfishness, but out of a genuine desire to understand and to help heal. And then came Alex Sternbergen (Viveca Van Lauren). My sister refused to see the film, as she thought it would be too scary. Of course, I was determined to see it. 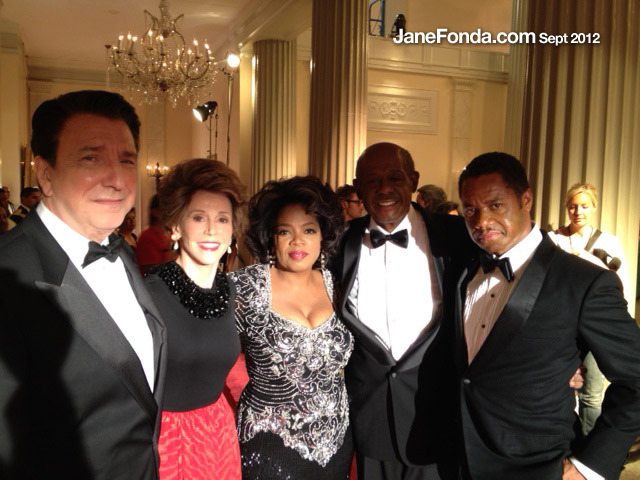 “Jane Fonda’s in it! Sidney Lumet directed it!” No way was I going to be dissuaded. And here I’ve gone on again. Again, I apologize. I was going to write about how, in a Principles of Democracy course I took in high school, I wrote a paper called “Reel to Real,” in which I explored the manner in which art (at its best) reflects life and serves both to inform and to enlighten us. You and some of the films you’d made were the subject of said paper. Perhaps another time. Oh, and My Life So Far. Need I tell you it’s an exceptional biography. As you’ve shown in your acting, you’ve also shown in writing that yours is a moving, insightful, and singular talent. Though I’m an avid reader (I just finished a Pulitzer Project, wherein I read every work of fiction that won the prize), and my tastes are eclectic, I often pull your book down from the shelf and submerge myself in it again. Thank you for coming back and continuing your art. One who has accomplished what you have could easily rest on her laurels. But you continue to show us what’s most important in art and life: to be curious; to be inspired; to learn; to share. After all, in life, we are all works-in-progress. Good evening to you, Ms. Fonda. Ms. Fonda, given the happiness, instruction, and passion for art and vocation that you’ve brought to my life, it’s not only a pleasure but a privilege to offer YOU some happiness.